Wales boss Ryan Giggs has revealed that Aaron Ramsey has suffered a thigh injury, but has eased fears for Arsenal over the seriousness of the issue. The 28-year-old is set to quit the Emirates at the end of the season after Juventus officially confirmed that they will sign him on a free transfer this summer. Despite the fact that he’s on his way out in a matter of months, Ramsey has continued to be a vital figure in Arsenal’s plans, scoring four goals and providing eight assists in 35 appearances so far this season. That in turn has helped keep them in fourth place in the Premier League table, with the all-important battle for Champions League qualification raging on. However, the Gunners were handed a concern on Tuesday as Giggs revealed that the midfield ace had sustained a thigh injury which will rule him out of the friendly against Trinidad and Tobago on Wednesday night. Fortunately though, he remains hopeful that Ramsey will be back to face Slovakia in the Euro 2020 qualifier on Sunday, although they may well have to monitor him in the coming days to ensure that the injury has indeed fully healed up. “Aaron’s just got a slight knock to his thigh and we are monitoring that this week, but he should be OK for the weekend,” he is quoted as saying by Sky Sports. Arsenal will undoubtedly be monitoring the situation closely themselves, as the last thing that they’ll want to see is Ramsey risked and potentially aggravating the issue. 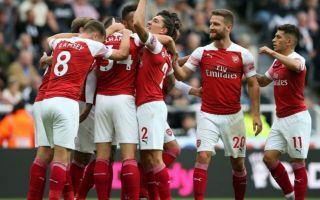 Unai Emery’s side face Newcastle United on April 1, and so the rest of the squad certainly have plenty of time to regroup and prepare for the season run-in with eight crucial games to come still. Ramsey will undoubtedly hope to play a key role himself prior to his exit.